At best, you’re an enabler. But you might also be an accessory to a number of crimes. Bank of America has been in and continues to be involved in a great number of illegal, quasi-legal, and dubious practices, which put it at odds with the University’s mission. The Bank had done serious damage not only to our financial industry, but also to the nation’s poor. The company has a particularly unpleasant history, but in the past several years it has: conspired to rig global interest rates; been fined $137 million for its role in stealing money from poor schools and cities; used fraudulent documents in an attempt to evict borrowers from their homes; and knowingly sold worthless mortgages to state and union pension funds, which cost them hundreds of millions of dollars. 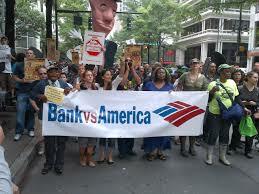 Recall that in early 2012, Bank of America was required to pay $12.7 billion to settle allegations of fraud. All the while, the company has been the recipient of at least $45 billion in bailout loans. Simply put, these are not the kind of people you should want to do business with. The Bank is currently responsible for 12% of all the bank deposits in the country. (The federal limit is 10%.) The Justice Department might be willing to look the other way, but we should not. The contract with Bank of America might be saving the University money, but it is costing nearly everyone else. But you have options. According to Move Your Money Project, there are a whole host honest and reputable banks credit unions that would be more acceptable options.